Maybe Monday wasn't the best day for my linky party with my graduate class being on Monday night, but better late than never! I use these with my K and 1st grade for High/Low and in preparation for sol-mi. The stars are little erasers I found in the dollar bin at Target at some point. I probably should buy stock in Target! This is a staff I use without a clef. I use this when working in do clef and I show on the board where our do clef is going to be. I have a piece of staff paper that I put on colored cardstock and laminated to make a class set. I also have some with treble clef. I have tons of different erasers that I separate out into baggies for each student. I use apple for Apple Tree, Smiley Faces for "Hey Hey", stars for "Starlight, Starbright", "A+" erasers that I use for "Johnny's It" and "Weevily Wheat", Hearts that I use for lots of valentines songs, and the colored circles were a free find in the teacher lounge at the end of last year. I think another teacher used them as math counters. 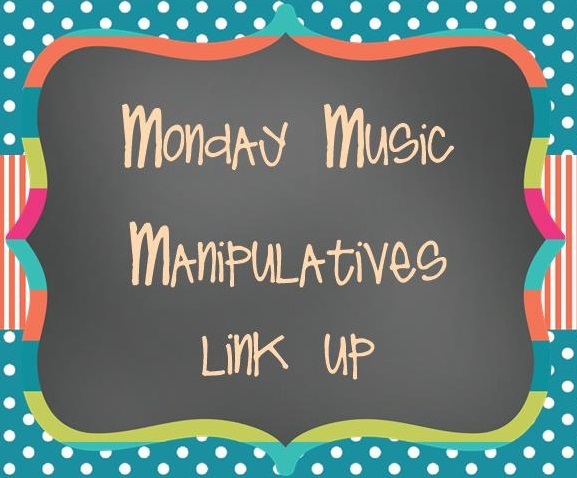 Want to link up and share your manipulates? Write a blog post and then link it below. 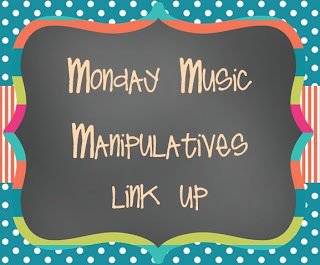 You can include my Monday Music Manipulatives picture to link to this post if you want! Can't wait to see and hear about your ideas! Great idea Lindsay! I need to go out and get some erasers now! I know! I am always on the lookout for cute ones! I need to hit up the dollar aisle at Target! Great post! Thanks! I hope you find some good deals!